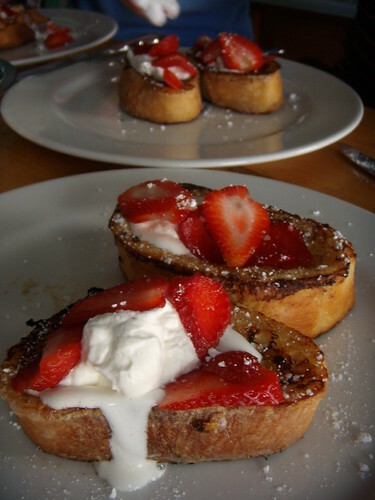 orange cardamom french toast, originally uploaded by aarn! +19th April, 2008+. made a heavy cream, orange juice, egg, oil, and cardamom batter, and soaked some thick slices of ciabatta until saturated, then seared both sides in butter and threw them into the oven on the grates to crisp up for a bit. topped with some fresh vanilla whipped cream, sliced strawberries, and some powdered sugar. crispy on the outside and gooey on the inside, this was a great breakfast.